Water, Sugar, Food Acid (Citric Acid), Flavours, Colours (E122, E150d, E110, E102, E123, E133), Preservatives (E202, E211, E223). 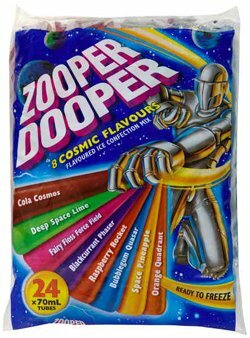 These ice blocks freeze quickly, are a good size and this pack comes with a variety of flavours. Always excited to be able to order these!! Certainly miss not being able to buy these in the supermarkets in the UK!